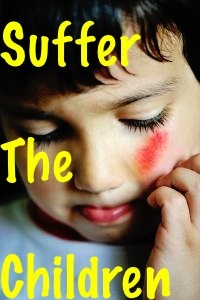 Luke 18:16, Matthew 19:14 and Mark 10:14 record Jesus’ words, “suffer the little children…” STOP HERE! More than 3 million children or 1 out of every 25 kids in the United States experiences maltreatment. For more than 1 million children, the experience of maltreatment results in demonstrable harm. In 2010, 1537 children died from maltreatment (more than 3x the number of soldiers killed in Iraq and Afghanistan the previous year). Much work is being done by national organizations and the government to address the issue of child maltreatment so that every child can live in a safe, stable, nurturing environment. Where is the church? Why is the church largely failing to address this issue and establish strategies to prevent children from suffering? This must happen to effectively let kids “come unto [Jesus]”, for it is very difficult to get physically injured, emotionally scarred and physically dead kids to come to Him. For 11 years, I have been involved professionally with 100s of these kids. In my role as a pediatric and forensic pathologist with specialty focus on child abuse, I regularly evaluate maltreatment that results in non-fatal injuries as well as death. I recognize that there is a usual population of children and caretakers that are “at risk” and usual characteristics of abusive injuries. Recognition is the crucial ingredient needed to protect children and ensure their safety and well-being. Have you seen this child – this faceless, nameless, injured child? -maybe even, in your home? Are we concerned that the injuries may be abusive – non-accidental injuries inflicted by a parent or caretaker? Or do we say, “NO! Not in my community, not in my church, not in my family!” Many people are comfortable shielding themselves from the reality of child abuse. Sadly, many of these people represent the “Church”. It’s time for ALL, not just designated social workers, law enforcement, or medical personnel, to remove the blinders and begin to recognize children, recognize caretakers, and recognize characteristic injuries. Children who suffer abuse represent every socioeconomic level, every ethnic and cultural group, all religions and all levels of education. It’s infants and toddlers that are recognized as a higher risk population. Statistics reveal that nearly 80% of children that die from abuse are less than 4 years old. Infant crying and toddler tantrums and toilet training issues are particular triggers for physical abuse. The majority of infants who suffer shaking related head trauma are less than 6 months old, and notably males are at greater risk. The ‘difficult’ child for reasons of health, temperament, etc is another factor that impacts the level of risk for maltreatment. In recognizing this high risk population of children, the church community needs to provide education and support to help families cope with the challenges of raising infants and young children. In recognizing the high risk parents/caretakers and the larger population of any parent/caretaker, the church community needs to actively engage in providing services that support nurturing family relationships and environments for children. Is it not expected that the church provide family support, education support, emotional support, addiction support, economic support (Acts 4:32-35)? Christians clearly have a biblical mandate to protect children from harm (Matthew 18:5-6). Church leaders may also be mandated by their state to report any suspicion of child abuse; failure to do so may be criminal. It’s imperative that the Christian community recognize the reality that children suffer (many at the hands of parents and caretakers) and begin implementing strategies to protect children from physical harm and additional devastating consequences of abuse. Only then, will we effectively be able to let children “…come unto [Jesus]”. Dr. Lora Darrisaw is an associate medical examiner for the Georgia Bureau of Investigation and specializes in pediatric pathology and the evaluation of fatal and non-fatal pediatric injury. Dr. Darrisaw also serves at Calvary Chapel Church in Snellville, GA. and is a friend and supporter of Vision 2 Hear. This entry was posted in Articles, Parents and tagged abuse, child, child abuse, children, maltreatment, parents, protection, youth leaders. Bookmark the permalink. Reblogged this on New Vision Youth.